School is back in session in many cities across Georgia. The first day of school is always exciting, new friends, new teachers, new adventures. But with a new school year there's always multiple concerns from parents. 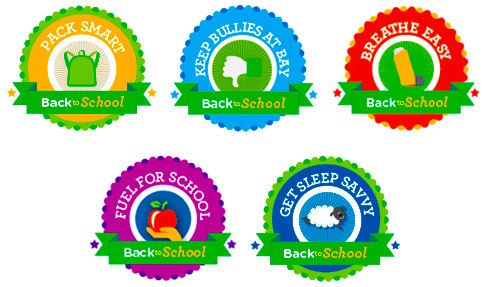 From establishing bedtime routines, packing healthy lunches, and empowering kids to stand against bullies, no school year is ever the same and they always come with a unique series of challenges. Our friends at Children's Healthcare of Atlanta want to help you ease your child transition to their new school year with a dedicated website that is full of tips and important information for a healthy and happy life. Pack Smart- Backpacks are a handy way for your child to carry hisbooks and other school materials, but if used incorrectly can put strain on his back muscles and joints causing lower back pain and injury. Breathe Easy- Asthma is one of the most common chronic illnesses in children and accounts for more than half a million missed school days annually. Creating an asthma action plan with your physician to help your child better manage his asthma. Fuel for School- Fuel your family with food throughout the school year with these nutrition tips that help kids grow strong from the inside out. Sleep Savvy- During the summer, many children and teens stay up later and sleep in longer than during the school year. This shift often makes returning to an early schedule difficult. Getting enough sleep is important and Children’s has tips to get kids back on track. Keep Bullies at Bay- Bullying is a pattern of unwanted, aggressive behavior among school-aged children where one child uses control over another. Learn common bullying behaviors and how your child should deal with a bully.